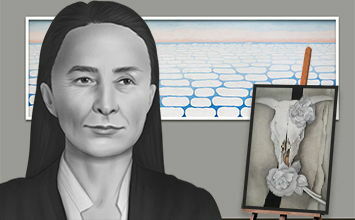 The below artworks are the most important by Georgia O'Keeffe - that both overview the major creative periods, and highlight the greatest achievements by the artist. Artwork description & Analysis: Blue II is indicative of O'Keeffe's early monochromatic drawings and watercolors, which evoke the movement of nature through abstract forms. While the curvilinear form in Blue II is reminiscent of a plant form, O'Keeffe was playing the violin during this period, and the shape likely captures the scroll-shaped end of the neck of the violin that would have been in O'Keeffe's line of sight as she played. The intense blue color suggests that she may have been familiar with Wassily Kandinsky's notion that visual art, like music, should convey emotion through the use of color and line. The intense blue perhaps suggests the sound of the music and the mood it evokes or expresses. Artwork description & Analysis: Petunia No. 2, one of O'Keeffe's first large-scale renderings of a flower, represents the beginning of her exploration of a theme that would mark her career. In this painting, she magnifies the flower's form to emphasize its shape and color. She stated that "nobody really sees a flower - really - it is so small - we haven't time - and to see takes time... So I said to myself - I'll paint what I see - what the flower is to me but I'll paint it big and they will be surprised into taking time to look at it." Her flower images often received interpretations that O'Keeffe disagreed with, particularly from feminist critics who saw these paintings as veiled illusions to female genitalia. For O'Keeffe, there was no hidden symbolism, just the essence of the flower. In fact, the anatomy of the petunia is incredibly detailed, and O'Keeffe may have been emphasizing the androgyny of the reproductive parts in order to counter the idea that her subject matter was connected to her gender. Though American and European artists had experimented with abstraction for at least a decade, O'Keeffe, like Dove, focused on images from nature and O'Keeffe was the only artist to consistently use flowers as a motif. Artwork description & Analysis: This painting illustrates O'Keeffe's skill in articulating architectural structures as well as her use of the highly realistic, yet simplified style of Precisionism. She uses the night backdrop to incorporate a play between structure and light, and between the straight lines of the architectural forms and the ethereal smoke, which is reminiscent of the folds of flowers. O'Keeffe's portrait of the Radiator Building, an Art Deco skyscraper that was completed just three years prior to the painting, presents an iconic image that captures the changing skyline of New York City that O'Keeffe often found claustrophobic. She depicts the building from a low vantage point to convey a sense of oppression with the building's towering presence over the viewer. The painting can also be read as a double portrait of Steiglitz and O'Keeffe; Stieglitz is represented by the Scientific American Building, as indicated by his name in red, and O'Keeffe by the Radiator Building. Object portraits of this type, influenced by the poetry of Gertrude Stein, were an important theme for artists of the Stieglitz Circle. Artwork description & Analysis: O'Keeffe became enamored with animal skulls after visiting New Mexico. Through the precise rendering of the weathered skull's surface and sharp edges, O'Keeffe captures the essential nature of the skull while also referencing the transience of life. Isolated on the canvas, divorced from its desert context, O'Keeffe uses the cow's skull and the red, white, and blue background to represent both naturalism and nationalism, or the relationship between the American landscape and national identity. Moreover, the subject could allude to the Dust Bowl and the Great Depression, thereby making an environmental and economic statement. What is clear is that O'Keeffe has created a memento mori that elevates this relic of the New Mexico desert to the status of an American icon. Artwork description & Analysis: O'Keeffe's landscape paintings are similar to her flower paintings in that they often capture the essence of nature as the artist saw it without focusing on the details. In works such as Black Place, Grey and Pink, O'Keeffe emphasizes the wide open spaces and emptiness of the landscape around her New Mexico ranch that she purchased in 1940 - vistas that are the opposite of her claustrophobic cityscapes. Her paintings of the area capture this sense of place and her attachment to it: "When I got to New Mexico that was mine. As soon as I saw it that was my country. I'd never seen anything like it before, but it fitted to me exactly. It's something that's in the air, it's different. The sky is different, the wind is different." The often surprising reds and pinks of the land in these paintings are accurate renderings of the colorful desert scenery. Artwork description & Analysis: O'Keeffe's subject matter was always inspired by her life and the series Sky above Clouds is no exception, as the painting speaks to her many travels in the 1950s and 1960s. While en route to the Far East, she became intrigued by the view of the clouds below the airplane and sought to render this aerial view in paint as if to symbolize her own expanded view of the world. Remarkably, as she was nearly 80 years old at the time, she began stretching enormous canvases, nearly 24 feet wide, to capture the expansiveness of the scene. This painting, with its high horizon line and simplified clouds that extend beyond the frame, shows the influence of Eastern landscape painting, which also often employs a high horizon line with a broad view of the land. The work underscores that O'Keeffe's art, whatever the motif, remains consistent over many decades: she renders a naturalistic scene or object in such a way as to focus on its essential formal elements and render it abstractly.